Want to Teach English in Costa Rica? Costa Rica has long been renowned for stunning natural beauty, enlightened environmental policies, a democratic government, dense and diverse wildlife, and warm, welcoming people. Our TEFL Certification Program in Costa Rica is in Manuel Antonio, which is located on the Pacific Coast, adjacent to Manuel Antonio National Park. The center itself is in an area that features a perfect blend of residential and commercial venues, with restaurants and shops. The school has free access to computers with high speed internet, and a snack bar serving complimentary coffee and tea daily. The facilities and computers are open seven days a week, including holidays. The four-week training course includes 150 hours of classroom time: 100 hours of in-class instruction, 35 hours of required reading and written assignments, and 15 hours of observation and practical teaching. During this course, you become familiar with the principles of successful ESL teaching and develop real-world skills to be an effective English teacher. 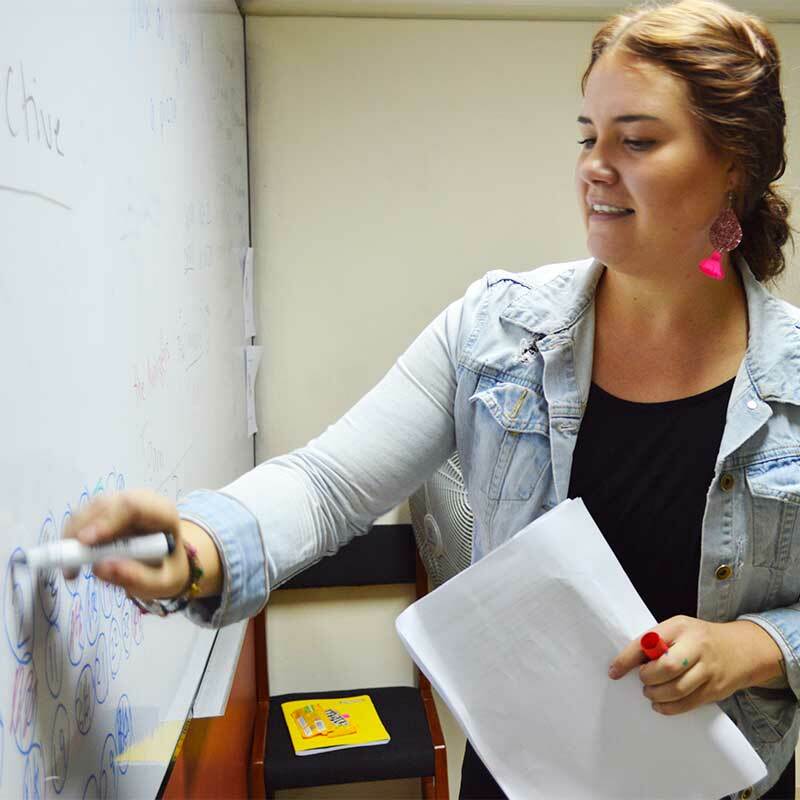 The TEFL program focuses on practical teaching, lesson planning, classroom management, teaching specific skills, like reading, writing, and not to mention grammar! Our supportive staff will help you to settle down in Costa Rica and will be available to you 24-hours a day. 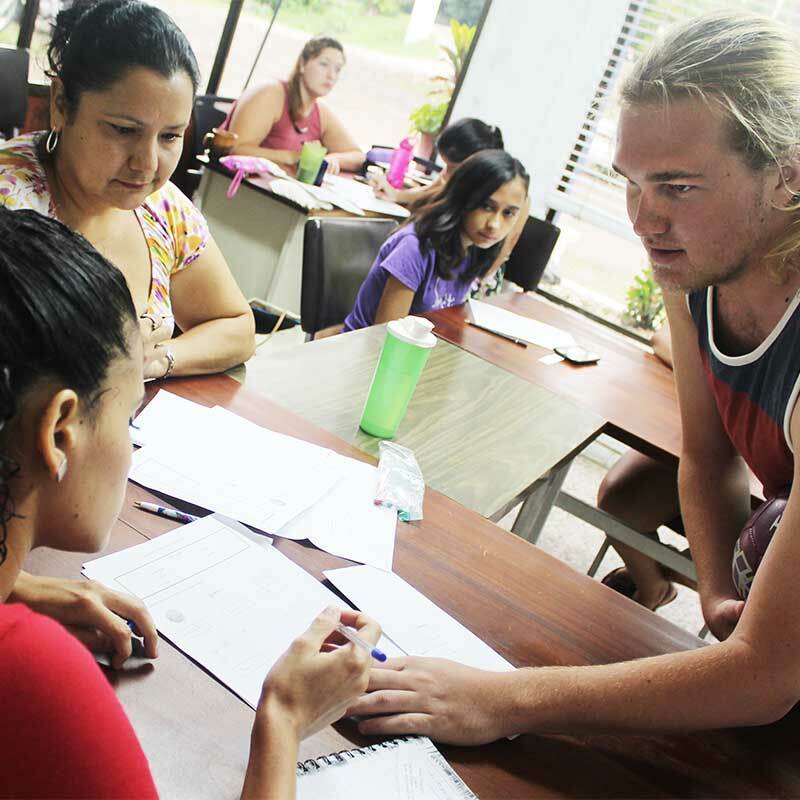 In addition to your TEFL certification course, you can also sign up for Spanish classes. We highly recommend taking one-hour daily private classes to get the most out of this experience. The local team can also set you up with a local for English-Spanish language exchange-A great way to quickly improve your Spanish and make local friends! The Teaching Internship Program Fee in Manuel Antonio, Costa Rica is US$4,695. Included in this price are the course materials, four weeks of 1-hour private Spanish classes and a private room with a host family including breakfast and dinner. Please note our Teaching Internship in Costa Rica involves 2 locations. Your TEFL Certification Course takes place in Manuel Antonio, while your Teaching Internship takes place in San Jose. Airport pick-up is included in all prices. Accommodations during the training can be arranged with host families for an additional cost of US$815 ($430 for the Combined Program). This includes breakfast and dinner. You will have a private room and a shared bathroom. Accommodations are also available in a private apartment for US$795. Alternatively, a private room in a hostel or hotel can be arranged; please contact us for details. If you stay in an apartment, hostel or hotel, you will be responsible for your own meals. As one of the more developed countries, Costa Rica is sometimes considered ‘the Switzerland of Latin America’. To increase their chances of employment in this country where tourism is an important source of income, Costa Ricans know that bilingualism is important and they are rather serious about their studies. LanguageCorps teachers find opportunities working with all age groups, both in private institutes and public schools, although the majority of the students are business professionals. Most teaching positions are found in the Central Valley, in and around San Jose, since that is where the majority of jobs are. Our teachers have also found employment in Heredia, Cartago, and Liberia. The average amount of hours an ESL teacher in Costa Rica works per week varies. At private language institutes, teachers usually work between 20-30 hours per week. At K-12 schools, you should expect to work 30-35 hours per week. Private language institutes hire year round while K-12 schools and universities follow the Latin American school year, and hire between January and February. There is another peak hiring season in June and July. Most language schools will want to meet their teachers in person before they hire them, so it’s best to start looking for jobs from within the country and visit the schools in person. Sometimes a Skype interview in advance is possible. A TEFL, TESOL or CELTA certificate is requiered for teaching ESL in Costa Rica and makes you very marketable as a teacher. A 4-year degree is necessary for teachers that want to teach at K-12 schools and universities. Otherwise a degree is preferred, but not required. Wages for teachers in Costa Rica are normally between $600 and $800 per month. Costa Rica is a break-even market; you should be able to live comfortably and cover all your expenses while living abroad, but you probably won’t be able to save much, as room and board generally average more than $500. While most schools and companies in San Jose pay salaries to teachers, those in more rural locations frequently offer only accommodations and meals. Benefits: housing and airfare are not provided by the employer. Most people, including those from the U.S., Canada, Australia, and Europe, automatically receive a 90-day tourist visa when entering Costa Rica. This covers the duration of the certification course. The most common way for teachers to work in Costa Rica, just like most of Latin America, is on a tourist visa. Hiring schools typically pay their teachers under the table. Every 90 days, teachers leave the country to renew their visas, and usually take this opportunity to take a short vacation across Costa Rican borders. If you are looking to teach in Costa Rica long-term, it is recommendable to apply for a work permit. It is not common for schools to sponsor their teachers for a work visa, but also not unheard of. Some teachers manage to work as independent contractors. Costa Rica literally means ‘rich coast’. This Central American country borders with Panama to the south and Nicaragua to the north. On the eastern side, you find the Caribbean Sea while in the western part of the country you can enjoy the Pacific waters and beaches. Costa Rica has more than 800 miles of coast line. This relatively small country contains nearly 6% of the world’s biodiversity! You can find around 200 volcanoes, some of which are over 65 million years old. The highest mountain in the country is the Cerro Chirripo, with an elevation of 3820 meters (12.533 feet). Columbus landed in Costa Rica in 1502, but it wasn’t until 1838 that this nation of mountains and beaches became an independent republic. Having grown relatively wealthy from coffee and banana exports, Costa Rica is now a haven for tourists and travelers, as well as a proud democracy with a growing industrial sector (Intel accounts for about 20% of the country’s exports). The country is known for international surfing championships and easy access to swimming, snorkeling, horseback riding, jungle hiking, wildlife photography, and more. You can definitely expect to see a sloth here! Costa Rica’s tropical climate is characterized by a rainy season (May into November) and a dry season (mid-November through April). Temperatures vary based on altitude, from year-round beach weather on the coasts to the consistently temperate mountain valleys. Religion plays an important role in Costa Rican culture, around 75% of the population identifies as Catholic. Family is an important value in Costa Rica, as family members are very close and may live together as well. Unlike many other Latin American countries, only less than 1% of its population is of indigenous ancestry. Over 90% has European roots! Costa Rica is one of the very few countries in the world without an army-the military was abolished in 1948. The country has been named the most sustainable, happy country in the world and people are very proud to be ‘Tico’, a colloquial for ‘native of Costa Rica’. Their air of ‘Pura Vida’ makes them very enjoyable students. While Costa Rica is not famed for its cuisine (beans and rice or rice with beans? ), San Jose offers a wide array of remarkably affordable international restaurants. Water in San Jose is generally safe to drink, though bottled is the way to go once out of the city. Costa Rican dress can be described as “Western tropical.” Linens and cottons are appropriate in the city (along with a sweater for chilly mountain nights), while wilderness lovers are advised to put function before form. From misty cloud forests to active volcanoes to pristine rainforests to lush tropical coasts, Costa Rica holds something special for everyone who visits. While much of Manuel Antonio is modernized, much retains its local flavor, and even more is pure tropical rainforest. The town center, like most in Costa Rica, has a soccer field and park with a church opposite. Visit the beach, the National Park, or head into town to do some shopping – either way, you’re bound to enjoy your days here. Nightlife in San Jose, fueled by tourists and university students, requires a taste for salsa and merengue and the stamina to sample the wide variety of bars and dance-clubs that fill the livelier sections of the city. San Jose also boasts the well-planned bird-watcher’s paradise of Parque del Este, while nearby the famous white waters of the Reventazón River beckon hardy rafters. The varied ecologies of the Río Sapiqui region, north of San Jose, draw environmentally-conscious visitors from around the world, especially to the misty, orchid-filled cloud forests of Monteverde Reserve. One of the nation’s most stunning national parks, Manuel Antonio is a living paradise and nature lover’s dream. The trees are alive with tropical birds and three species of monkeys, including the rare mono titi (of which only 1200-1300 are left in existence). Wild orchids and butterflies abound, as well as sloth and the inquisitive coati.